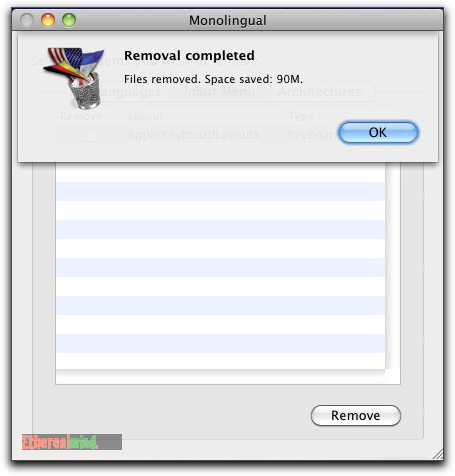 A quick post to look at how much space is saved using Monolingual on Snow Leopard Server. Max OSX comes with a lot of redundant files and content. 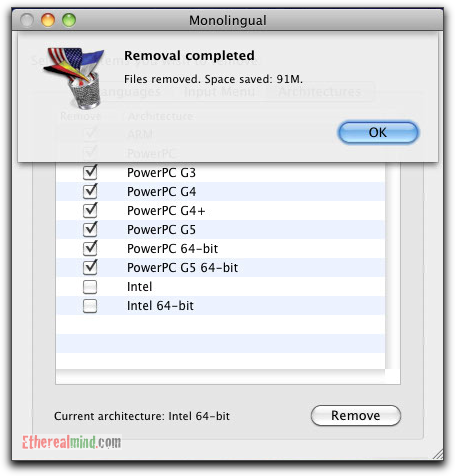 Monolingual is an open source utility that locates and deletes unused languages, keyboards and obsolete CPU code this improving the amount of space on your computer. 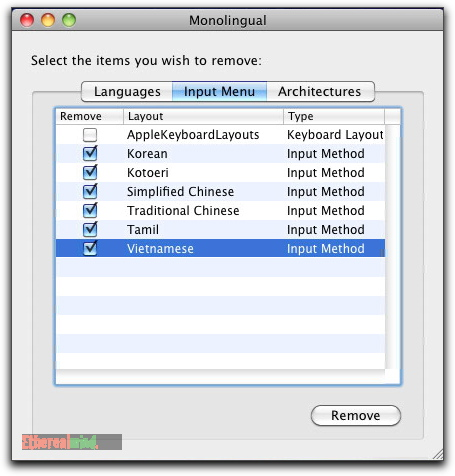 Snow Leopard comes with support for more than a hundred languages. And each program comes with it’s own language translation for the help and dialog boxes. For example I’m never going to use the Dzonghka language. You must NEVER delete the English language. It’s used by the Operating System when translations don’t exist. Once you click remove you will be asked to enter your Administrator password and the deletion will process. Not bad, 654 Megabytes saved. Not much point in keeping the keyboard languages that I don’t use. A lot of the software that you install on the Mac has code for older CPUs. It’s not needed and can also be deleted. Another ninety megabytes. Not as much as I though. 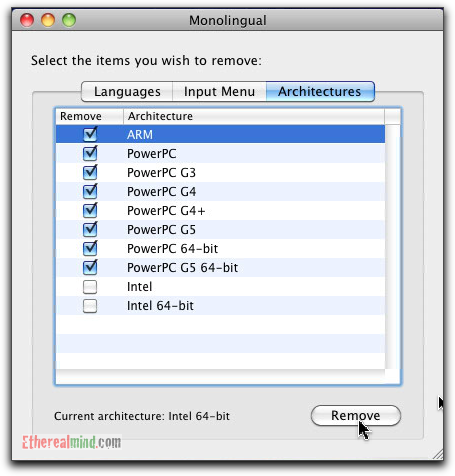 When you add new OS or Program Updates, new language and CPU files are added. Therefore, running Monolingual occasionaly is a good idea. I have one program (out of the fifty or so that I use regularly) that needs to be reinstalled after Monolingual is run. From this I conclude that older software that uses the legacy CPU architectures doesn’t handle the removal of languages. 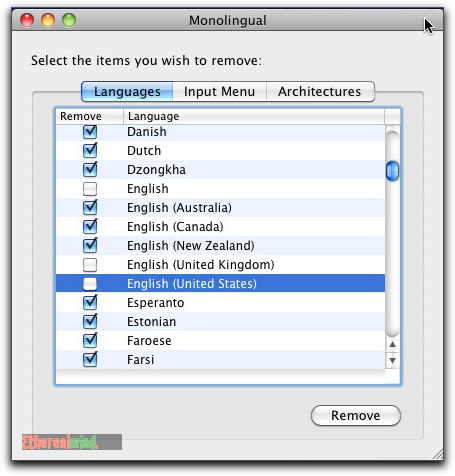 It would be impractical to test this for a reall corporate environment where you are running applications that are critical and therefore would not recommend using Monolingual in a production OS X Server environment. I do use this tool on my lab OS X Server with Snow Leopard and everything appears to run just fine. 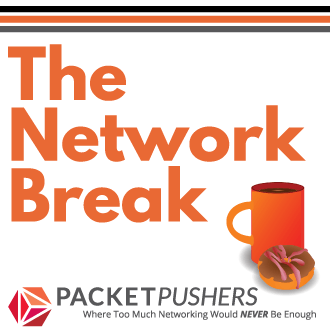 I will update if there are any problems. 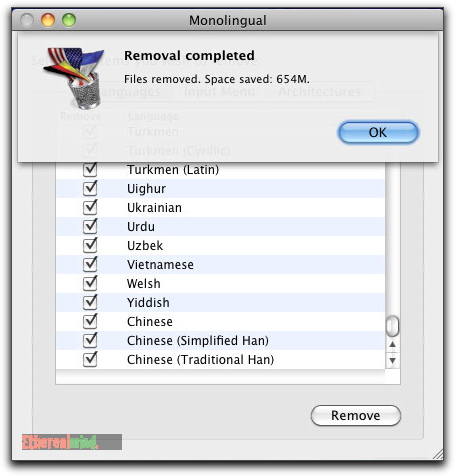 I used Monolingual to free up space on my Macbook Pro and in a hurry checked off the English language files. Though it warned me AND I DID UNCHECK ALL THREE ENGLISHES ON THE LIST my Macbook doesn’t work. The apps open but will not open a usable window. Then I can’t close the apps. Not even Finder works. I figured I would just reinstall OSX but I can’t find the disks that came with the laptop! I found an english.lproj.zip file online that might work but how to install if Finder doesn’t work? I’m not an expert on this. I would be restoring from your time machine backup that you made before you started. You did do a backup didn’t you ?